iCloud was riddled with syncing issues. Developer issues. Confusing interfaces. Pricey storage tiers. Music vanishing from computers. Apple may have mastered great hardware, but it was still struggling with cloud services, especially compared to rivals like Google and Microsoft. As much as I prefer the iPhone and Mac over alternatives, I still find myself rarely using iCloud. I have all my photos stored in Google Photos. I use Spotify for music. I use Microsoft’s Wunderlist for my to-do lists. Just about every service on my iPhone is powered by one of Apple’s cloud rivals. But after over a week with the upcoming macOS Sierra beta, and after looking at all the features coming to iOS 10 and the Apple Watch, I’m beginning to see vast improvements to iCloud. It’s too soon to make a call now since the final versions of these updates won’t be ready until the fall, but I can definitely see myself starting to transition to Apple for just about everything. First, there are a lot of thoughtful additions that help your Mac, iPhone, and Watch talk to each other. With the new watchOS 3, you can unlock your Mac without a password as long as you’re wearing your Apple Watch and both devices are signed into iCloud. You can also use your Apple Watch or iPhone’s fingerprint sensor to validate payments in Apple Pay on the web, which is much easier than tediously typing in your credit card information every time you want to buy something. 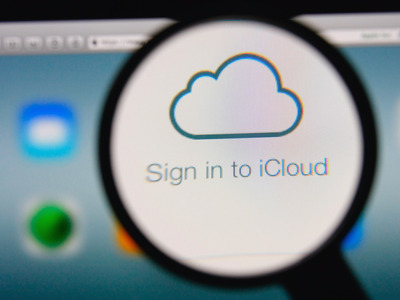 With those updates, iCloud is making it increasingly possible to never have to worry about passwords again. Apple Photos also got a huge update. Just like Google Photos, Apple Photos can scan the content of your images and automatically group them together into albums or slideshows. It also makes searching through your photos a lot easier. Looking for photos of your cat? Just type “cat” and you’ll find them. It will also use facial recognition so you can automatically search for photos of your human pals. 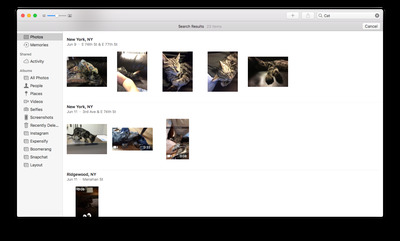 Screenshot/Tech InsiderPhoto search works! Here are pics of my cat Larry. Even better, Apple does all that content analysis locally on your Mac or iPhone, so its servers never know what you’re taking photos of, unlike Google. That’s good news for those who are wary of sharing that kind of data with a company. It works pretty well too, at least in my limited experience. But it will be a few months before I’m able to decide if Apple Photos is a better option than Google Photos or something else. There’s another feature I haven’t been able to try but can’t wait to use: copy and pasting between Mac and iPhone. There have been countless times I wish I could’ve easily copied a password from my iPhone to my Mac or a photo from my Mac to my iPhone. And probably a zillion other tiny scenarios over the years that I can’t think about now. This was probably one of the most overlooked features announced at WWDC this year. It’s not all rosy though. I have noticed some issues that still remain with iCloud after all these years, but the biggest one is iMessage. For some reason, iMessage never seems to work properly for me between my iPhone and Mac. Sometimes I’ll get a message on my iPhone and not on my Mac. Sometimes it will be the other way around. Sometimes they appear out of order on my Mac. And, inexplicably, whenever I log into a new Mac for the first time, none of my iMessages carry over. I have over two gigabytes of iMessages, and they always seem to appear when I log into a new iPhone, but never on Mac. That seems crazy considering Facebook Messenger, Telegram, WhatsApp, Twitter, and just about any other major service that offers private messaging are able to flawlessly sync no matter what device I use. Maybe it will get better after that huge iMessage update hits iOS 10. Maybe. Those are just a few examples, but you can easily see that over the last few years, Apple has made a ton of progress with iCloud. It’s not just about storing files, photos, and music online and syncing them across multiple devices. It’s about making all those devices work together to make life easier. 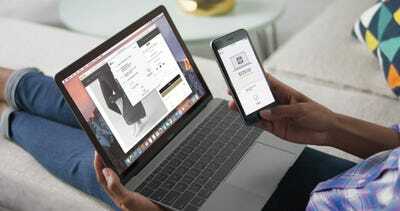 If you choose Apple’s hardware for everything, it’s increasingly getting more difficult to snub iCloud.